White intends to break open Black's defenses. The sacrifice is necessary. If 15....fxg6, 16. Qxg6+ Kf8, 17. Rxe6 with a good game for White. If 16.....fxg6, then 17. Nxg7+ Kf8 (if 17....Kf7, 18. Qxg6+!! ), 18. Nxe6+ and Black loses his Queen. If 16.....exf5, then 17. Nxe7 Nxf4 (if 17.....Nxe7, then 18. Bd6), 18. Nxc6+ Kf8, 19. Qa3+ and Black loses his Queen. The Bishop could not be taken because of the threat Nxg7 mate or Nxd6 mate. If 17. .... fxg6, then 18. Nxg7+ Bxg7, 19. Qxg6 mate. If 22.....Kf6, then 23. Nxh6 gxh6, 24. Re6+ Kg5, 25. e4 mate. White threatens 24. Nxh6+ Ke7, 25. Nxg8+ Ke8, 26. Bd6+ and White wins. The Botvinnik Defense I, Edge Variation. A necessary sacrifice to open up the e4-h7 diagonal. If 13...f5, then 14. Ng5 h6, 15. Bd5+ Kh8, 16. Qg6 (threatening Qh7 mate) hxg5, 17. Qh5+ Bh6, 18. Qxh6 mate. If 13....h6, then 14. Bxh6 gxh6, 15. Qxh6 f5, 16. Bd5+ Rf7, 17. Ng5 with a good game for White. If 15....f6, then 16. Bd5 fxg5, 17. Qg8+ Ke7, 18. Qxg7 mate. If 16....f6, then 17. Nxf6 Qe6, 18. Bd5 with a good game for White. Taking advantage of the pin, White presses on with the attack. If 19....Bxh6, then 20.Qh8 mate. The same mating move follows after 19....g6 or g5. 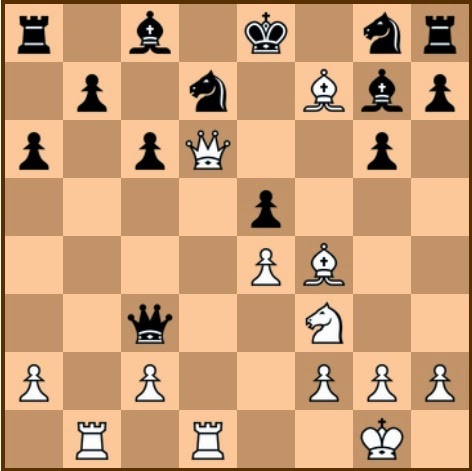 The Colle System, also known as the Colle–Koltanowski system, is a chess opening strategy for White introduced by Belgian Edgard Colle in the 1920s, and further developed by George Koltanowski. This variation of the Queen's Pawn Game is characterised by a systematic if modest development of White's minor pieces to support a quick pawn move to the e4 square. It is solid, but inflexible. 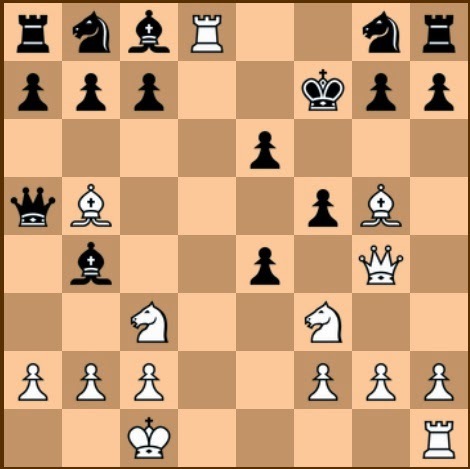 Ignoring Black's responses in order to consider White's moves only, the typical plan is as follows: 1.d4 2.e3 3.Nf3 4.Bd3 5.0-0 6.Re1 7.c3 8.Nbd2 9.e4, with White rearranging his move order appropriately. It is a perfectly solid scheme of development, but, inflexibly applied, it cannot offer more than equality against a vigorous Black response. It may be a good tool for avoiding book variations, for Blitz play, or for forcing opponents to think for themselves early on. These days it is considered totally innocuous, and is rarely seen at Master level or above. White has determined Black's weakness, and presses on with the attack. The pawn intends to land at h5, to menace the opponent King. The move breaks apart the King's defenses. If 15....fxe6, then 16. Qd3+ Kf6 (if 16....Kh5, 17. Qf3+ Kxh4, 18. Qh3 or g3 mate. ), 17. Qf3+ Ke5 (if 17....Ke7, 18. Qf7 mate), 18. 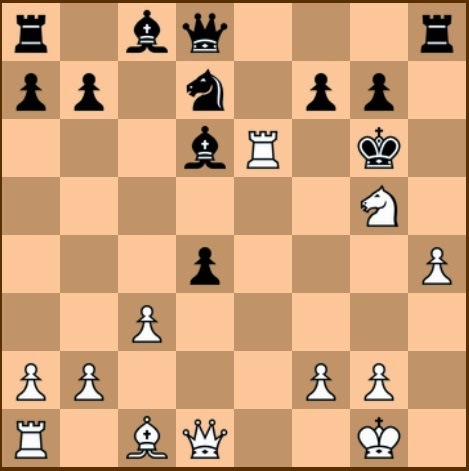 Nf7 mate. If 16....Rxh5, then 17. Qd3+ Kh6, 18. Nxf7 mate. White already wins with 17. Nxf7 but decides to place his Rook to safety. 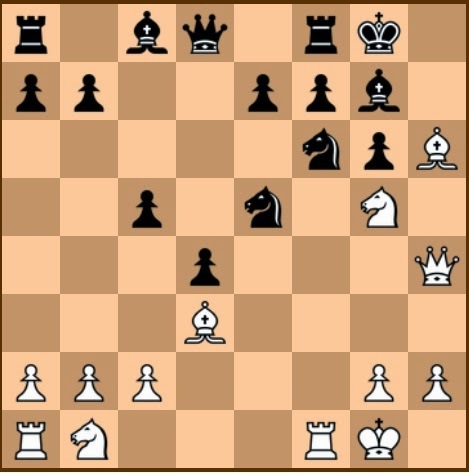 White cannot attack with Qd3+ because of Bf5. If 19....Kh6, then 20. Ne6+ Kh7, 21. Qd3+ Kg8, 22. Rd8+. 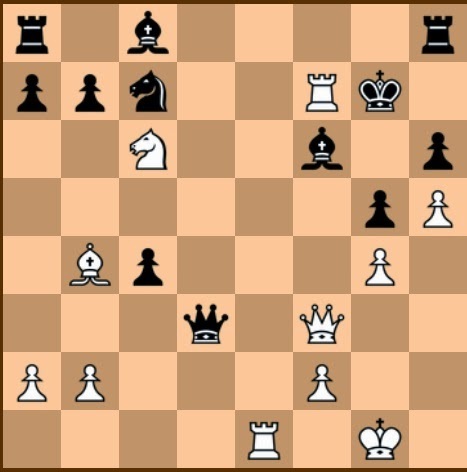 Black cannot prevent mate at f7. The Janowski-Larsen Variation of Queen's Gambit Accepted. 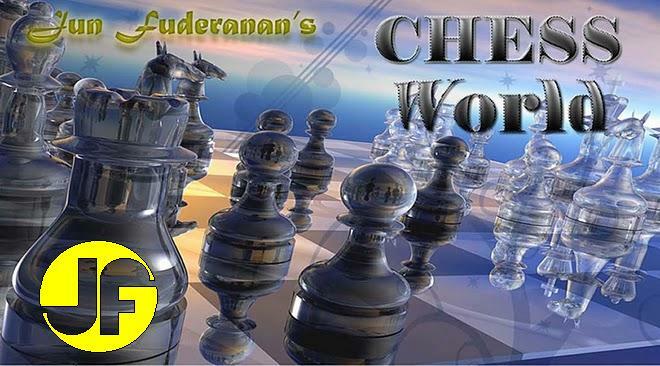 The double-pawn structure may benefit White if he plans to castle on the queen side and his opponent on the king side, but White eventually castled where the war zone is. Apparently White is trying to attack the e6 pawn, but this move benefited Black more. Black threatens Qg4+ threatening White's d1 Rook. If 14.....Nxc3, 15. Rxd7 and the position favors White. White could not take the f4 Knight because of 16.....Qxf2+ 17. Kh1 Qf3 mate. Forced. If 17. Kf1 Qxf2 mate. If 17. Kh1 Qe4+, 18. f3 Qxf3 mate. Black threatens 19....Qxh2 20. Kf1 Qf2 mate. White resigns. Black threatens Qf2 mate, Now, if 22. Ke1, then Qf2+, 23. Kd1 Qf1+, 24. Kc2 Qxe2+ and the position favors Black. The Winawer Variation of the French Defense. 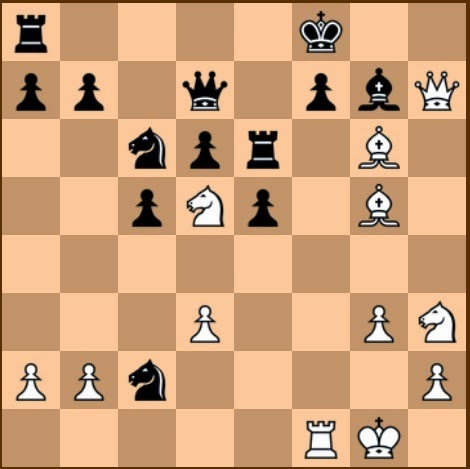 The Kunin Double Gambit of the French Defense. 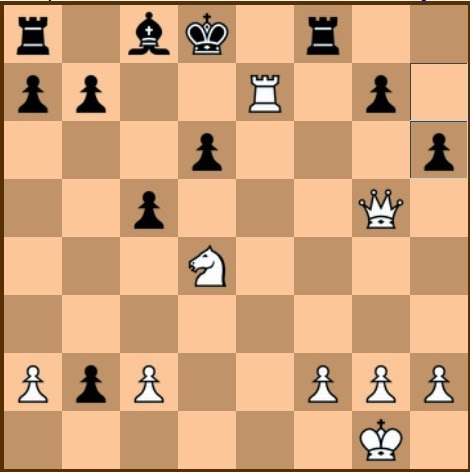 White sacrifices two central pawns to open up attacking lines. An exchange of Queens would favor White. If 9....exf3, then 10. Qxb4 c5, 11. Qb5 Nc6, 12. Rxc8 Rxc8, 13. Qxc7+ and White gains materials. Despite dangers to his Queen and Knight, White presses on with the attack. This subtle move actually has two mating threats. One is Be8+ followed by Bg6 or Bh5 mate, and the other is Ne5 (also mate). 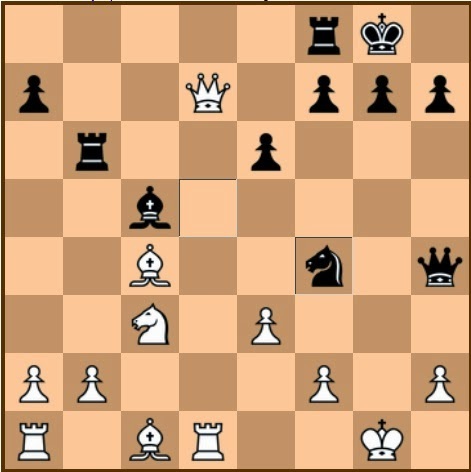 Black might prolong the game with 10....Nf6 but the end result is also mate. The game would continue: 11. Ne5+ Ke7, 12. Bxf6+ Kxf6 (not 12....gxf6, 13. Qg7+ Kxe8, 14. Qxf6+ Be7, 15. Qxh8 and mate next move. ), 13. Nxe4+ Kxe5 (if 13....fxe4 then 14. Qf4+ Ke7, 15. Qg5 mate. ), 14. f4+ Kxe4, 15. Qf3 mate. 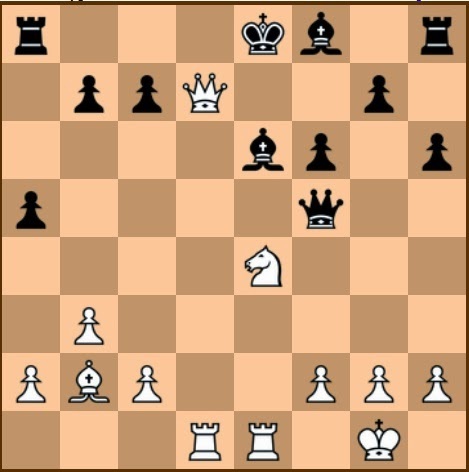 The Queen's Pawn Defense of Zukertort Opening. If 13....Qxg5, then 14. Nxe4 Qe7, 15. 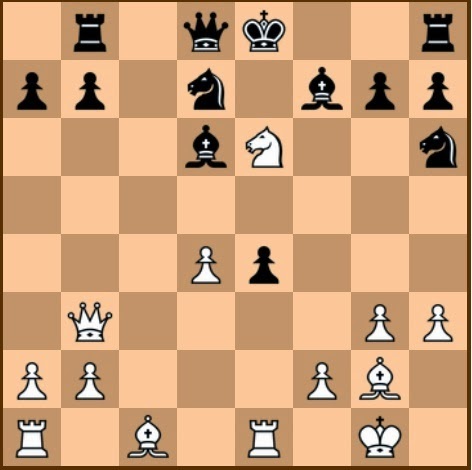 Bg5 Nf6, 16. Nxd6 Qxd6, 17. Bf4 with a good play for White. 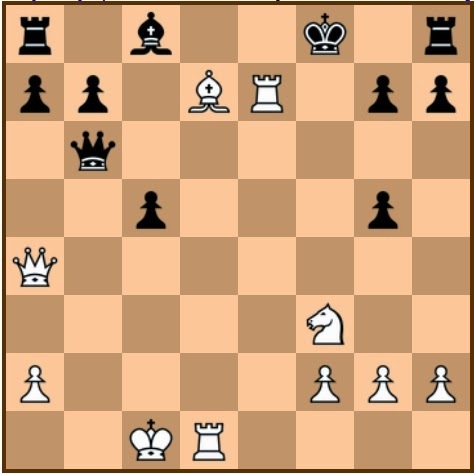 White breaks open the center pawns. If 15....Qf6, then 16. Rxe4 Be7, 17. Bg5 and White gains material. If 17....Qxd6, then 18. Rxd6+ Be7, 16. 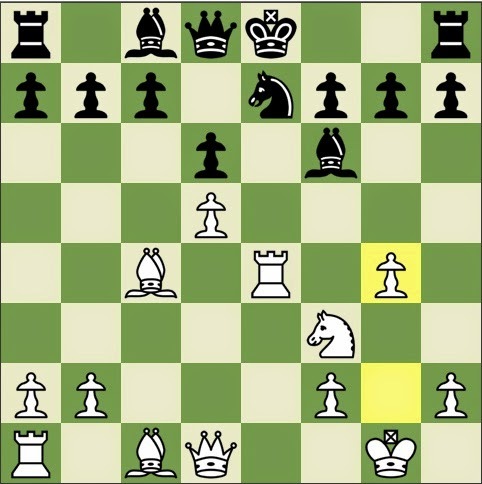 Bg5 Nf6, 17. 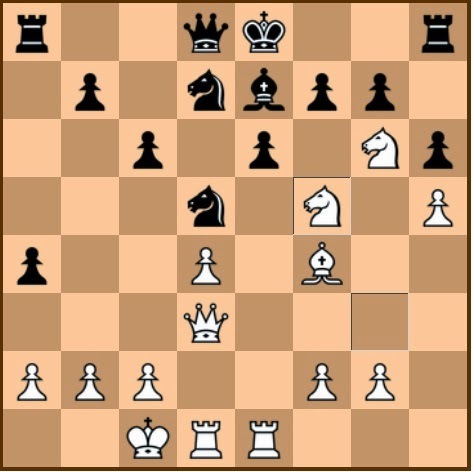 Rae7 Nf5, 18. g4 and the pinned Knight will eventually fall. If 18.....Qf8, then 19. Re6 Bc7, 20. Bg5+ Kc8, 21. Re7 Qd8, 22. Rc1 with excellent attacking possibilities. The Scotch Gambit Anderssen Attack. White takes advantage of the pins. An unexpected attack. Black has no choice but to capture the Queen. A magnificently executed attack, made even more beautiful by a Queen sacrifice. Black attacks the d3 Bishop, but actually is of no consequence. The Rook cannot be captured. If 14....exf6, then 15. Bxg7 and White mates at h8 or h7. If 14....Bxf6, then 15. Bg7 and same mate follows. A terrific brilliancy. White poses a mating threat at g7. The first in a series of attacks. This Knight attack on d6 cannot be underestimated. If 12.....Ne7, then 13. Nxd6 Qxd6, 14. Ba3 Qd7, 15. 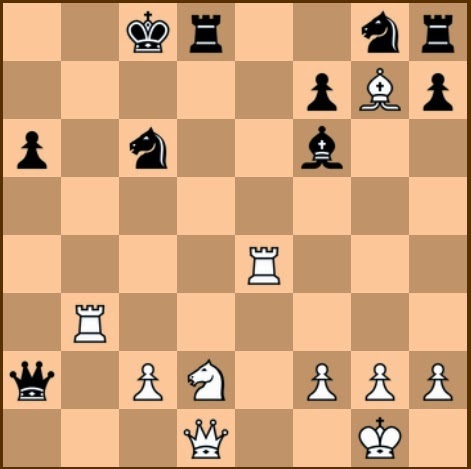 Re1 Ng6, Black would not be able to castle anymore. Black thinks he has solved the problem posed by the g7 Bishop. He is terribly mistaken. If 21.....Rd7, then 22. Rd3 Ne5, 23. Rxe5 and White wins. Black resigns. He will lose his Queen after 25....Rd7, 26. Re8+ Rxe8, 27. Qxc2. The Nakhmanson Gambit. White sacrifices the Knight to achieve greater Queen mobility. If 14. Rxe7 Qxe7, 15. Rxe7 b1=Q mate. If 14....g6, then 5. Qxh7 Bf5, 16. Rxe7+ and White wins. If 19....b1=Q, then 20. Re1 dis chk Kc7, 21. Qe7+Kb6, 22. Rxb1+ with a mating attack. Black resigns. He cannot avoid mate even if he captures the Queen. If 20......hxg5, then 21. Nc6+ Ke8, 22. Re7 mate. If after 20. Rxb7, Black moves Rf6, then 21. Nc6+ Ke8, 22. Re7+ Kf8, 23. Qxg7 mate. A brilliant ending! And Black has a pawn waiting for promotion. If 12....Qxa4, then 13. Rhe1+ Be7, 14. Rxe7+ Kf8, (if 14....Kd8, then 15. Rxd7+ Ke8, 16. Rd8 mate.) 15. Rxf7+ with a mating attack. Removing the King to safety in case Black moves pawn to a6. White sacrifices the Rook in order to expose the King. Black can only escape mate at the cost of materials, including his Queen. White intends to open-up the e-file. White keeps the pressure mounting. The Greco Gambit, Moeller-Bayonet Attack. An impressive variation of the Italian Game. The only logical explanation for the latest Black move is that Black desired to take control of the h file, and at the same time remove the pin on his King. If 20....Bxe7, then 21. Bxe7 followed by 22, Bf6+ with a good attack on Black's king side. A surprise move! Black doesn't know what is coming. It would be useless to take the Rook because of White's threat 26. Qf8 mate.